The first Presidential Debate is over. Every word and nuance was dissected by social media, economists, minimum wage earners, union leaders, body language experts, others whose opinions count, and of course the voters. "Who" was Hillary wearing? I'm not sure who but her choice of red was a great idea perhaps a message that she was trying to cross party lines. Red symbolizes war, power, determination. Last night it made Hillary look more vibrant along with great make-up and hair. I loved the flat shoes as a statement to woman who feel obligated to wear uncomfortable high heels. Trump wore a blue suit with a white shirt and blue tie. These colors combined with Hillary's red pants suit set the stage for red, white, and blue. Was that planned? As to Melania, she wore her usual solemn expression that I can't connect with. I also didn't like her black dress with the zipper back though others may like the look. In contrast Ivanka's pink dress did not disappoint for me. Enough about appearance although that and body language say a lot ... let's get to the debate itself. Did you learn anything? Did either candidate explain policy? The debate was more about entertainment than information with Debate Watch Parties going on around the city ... and everyone picking a team. The debate went as expected with Trump still showing his inexperience and lack of preparedness - his comments mostly filled with bumbling blather. And what was all his sniffling about? Did he have a cold? It was really annoying. 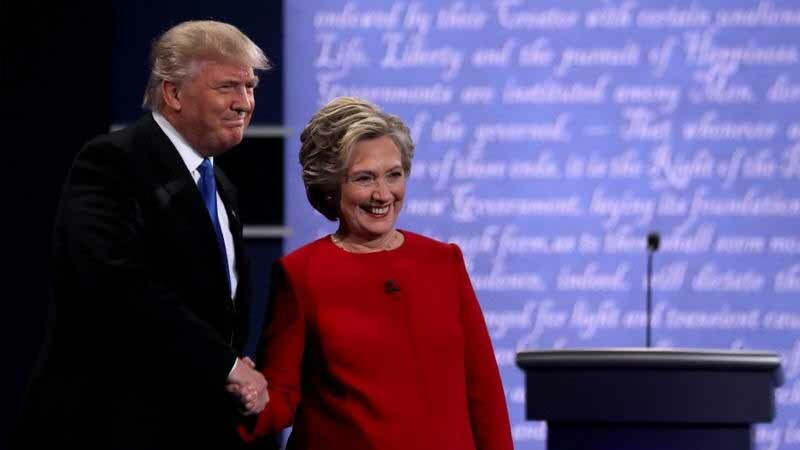 By the time it was over, it looked like the beginning of Trump's downfall as Hillary put him on the defensive time and time again - Temperament at the heart of the debate. No amount of practice could fully prepare her for Trump's hurricane of factual distortions, taunting interruptions and blustery generalities. Slowly but steadily she learn how to confront and subdue him on the fly. It clearly was a win for her. Has she officially become the lesser of two evils? Was he only in the race to get her elected? Have back-door deals and policies finally brought Hillary Clinton to the White House? Wasn't that the plan in 2008? In the Age of Technology there was overwhelming reaction from social media - tweeting and fact checking throughout the debate. This was the most tweeted debate in history ... so far. It was the candidates vs. the public trying to find flaws in their rhetoric as if a reality show or game. Bravo to Lester Holt who did a great job as moderator. With two debates remaining we still look at our choice of candidates realizing that it must all be orchestrated and try as we may to take the establishment down - that may never happen. Clearly something is going on behind the scenes - a battle for power that we know exists and can do nothing about as those who run the world fight for their survival at our expense. This is the way it is today and has been since the beginning of time - yet things see to be spiraling out of control for them as well. Is this election a reflection of what is going on elsewhere? To sum up Debate #1 - It was all staged with nothing unexpected happening. So glad this campaign season is almost over. We've learned a lot about the way things work, but also that everything is collapsing and no one can fix the issues. Reality will play out as is programmed.